I teach one course where I focus on sense of place and really look at environmental or urban planning issues, eventually large problem spaces as I would call them, but they often begin from a personal journey: where the sidewalk ends in front of your house, when you’re forced to change modes of transportation. That tells you something about how we live and where we are or places they have come to know as children and love, and I think that’s always a good place to anchor somebody. Why do they care about this park, and who takes care of it? What does that mean about other places like it or people who don’t have access to beautiful spaces like that? So I think at some point, you do want to narrow into some space, but I think understanding the richness of these spaces is really important because otherwise you’re just becoming sort of the imperial person moving in there maybe with good intentions but not with learning. Gesa Kirsch presents at the Rhetorical Listening Symposium at Syracuse University, October 30, 2014. 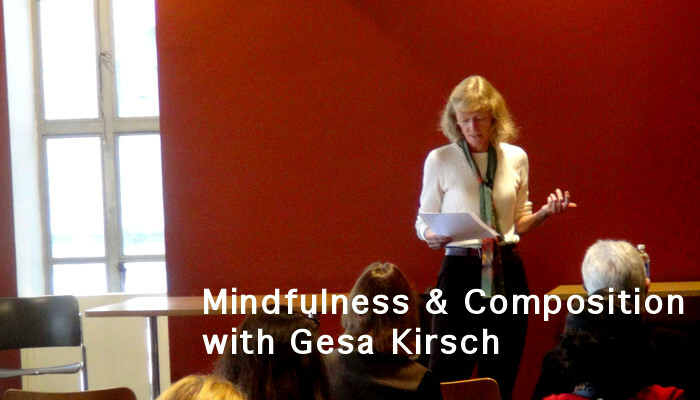 Episode 17 features an interview with Gesa Kirsch who presented her talk, “Mindfulness, Creativity, and Feminist Rhetorical Practices,” at the Rhetorical Listening & Composition Colloquium and Workshop Series. In this podcast, Kirsch focuses on pedagogical concerns related to listening, mindfulness, and civic engagement. The music sampled in this podcast is “Namer” by Higher Places, “Note Drop” by Broke for Free, and “Biomythos” by Revolution Void.